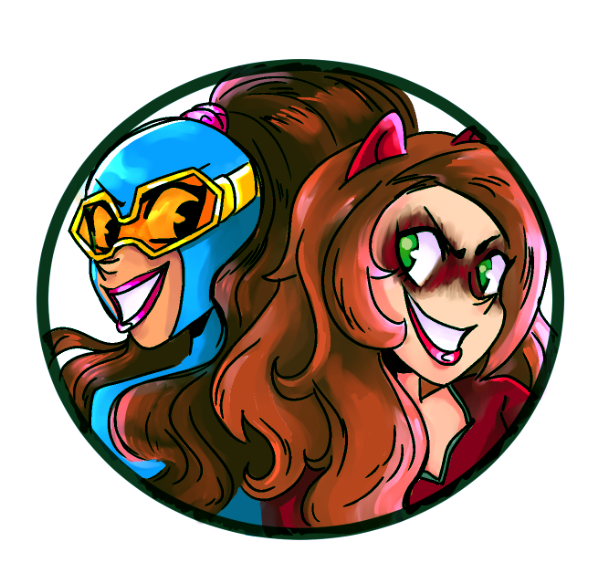 As I embark on my own potential comic book career with Gamer Girl & Vixen (pre-order the graphic novel today! ), I’m finding it very interesting how few awesome concepts get turned into superheroes. There are very few sports-themed superheroes, even though sports are pretty much currency here in America. There are very few dog-themed superheroes, despite an overabundance of cat sueprheroes. 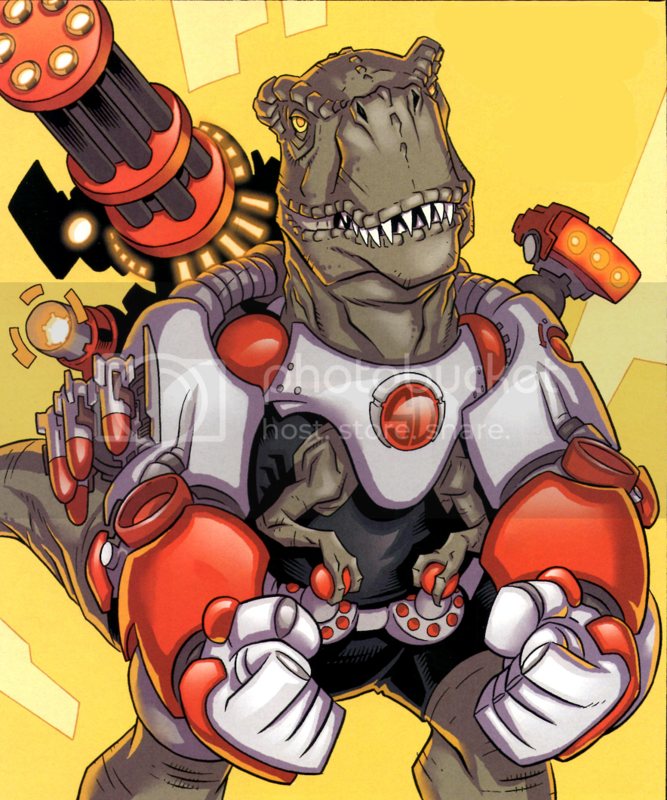 And there are very few dinosaur-themed superheroes, even though dinosaurs are awesome! We’ve got bat superheroes, spider superheroes, wolverine superheroes, cat super-villains and nearly everything else under the sun. But dinosaurs get a pass. Why is that? For that matter, why aren’t there more dinosaur everythings? Why is there only one popular movie franchise about dinosaurs? Jurassic Park doesn’t own dinosaurs as a concept! They belong to the whole world! Join me after the jump for a true dinosaur celebration, as I managed to find at least six dinosaur comic book characters! Devil Dinosaur is a giant, red, mutant Tyrannosaurus Rex created by none other than Jack Kirby himself. Marvel wanted something to compete with DC’s Kamandi, also created by Kirby, and they told him to add a dinosaur because dinosaurs are awesome. There were even plans for a cartoon! But for some reason, Devil Dinosaur, and his simian companion, Moon Boy, didn’t catch on. 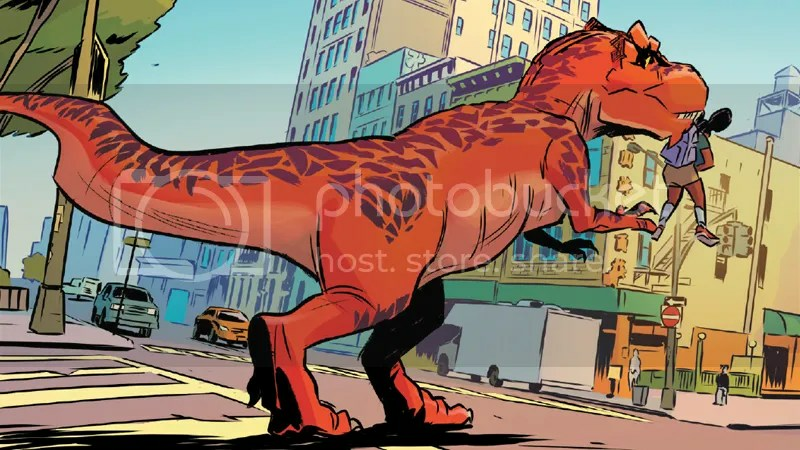 But a super strong, super smart and super red T-Rex tends to stick around, and Devil Dinosaur pops up here and then. He was the big bad guy in Nextwave, and he’s currently teamed up with kid genius Lunella Layfayette in the Moon Girl and Devil Dinosaur comic. Archie the T-Rex, Lorenzo the Triceratops, Reese the Stegosaurus and Cyrano the Pterodactyl are the Dinosaurs for Hire! Actually, they’re aliens who just happen to look like dinosaurs, and who hire themselves out as big gunnin’ mercenaries — whenever they’re not just straight up parodying late 80s and early 90s comics. 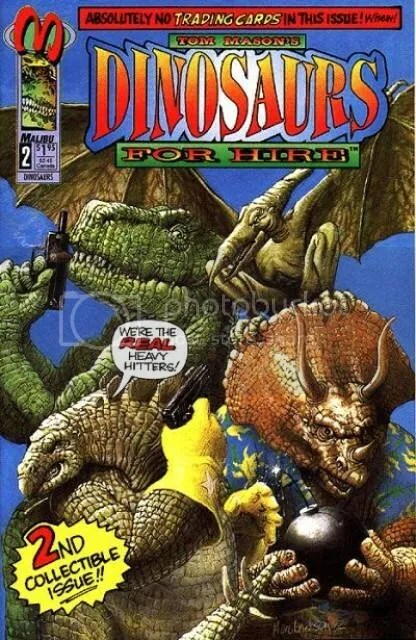 The Dinosaurs for Hire are a full-on parody comic that poked fun at the likes of the Ninja Turtles and Lobo, back when those things were all the rage. I had an issue myself, back in the day. But merchandising isn’t what it used to be, and these guys have been fossils for decades now. Leave it to Walking Dead creator Robert Kirkman to revolutionize dinosaurs in comics. Super Dinosaur is a Pixar-esque tale about a T-Rex with giant robotic arms! He still has his tiny T-Rex arms, but now they control this much larger robo-exoskeleton he wears on his back, with bigger, cooler, comic bookier arms! The visual alone is outstanding. Kirkman and his creative team came up with all manner of crazy backstory, like the T-Rex coming from Inner Earth, and a bunch of super-villain dinosaurs for him to battle, alongside his 10-year-old boy partner. But mostly, Super Dinosaur just looks awesome. Repil is what happens when superhero companies try to make somebody kewl for the kids. 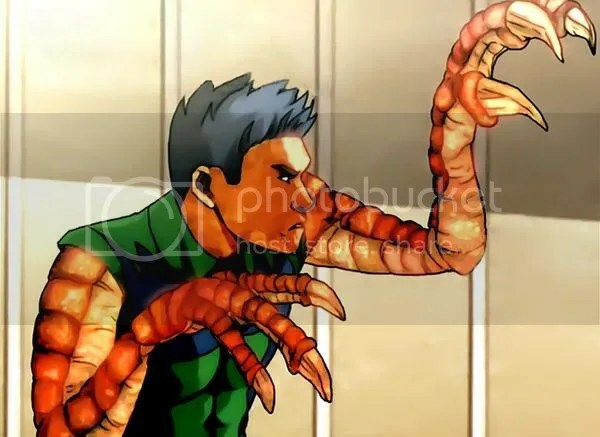 Reptil is a teenage superhero with the power to transform parts of his body into dinosaur parts, like giving himself a Tyrannosaurus head, Velociraptor claws or Pterodactyl wings. He was created for The Superhero Squad Show, a very kiddie cartoon about the Avengers, and Reptil was the audience surrogate character. 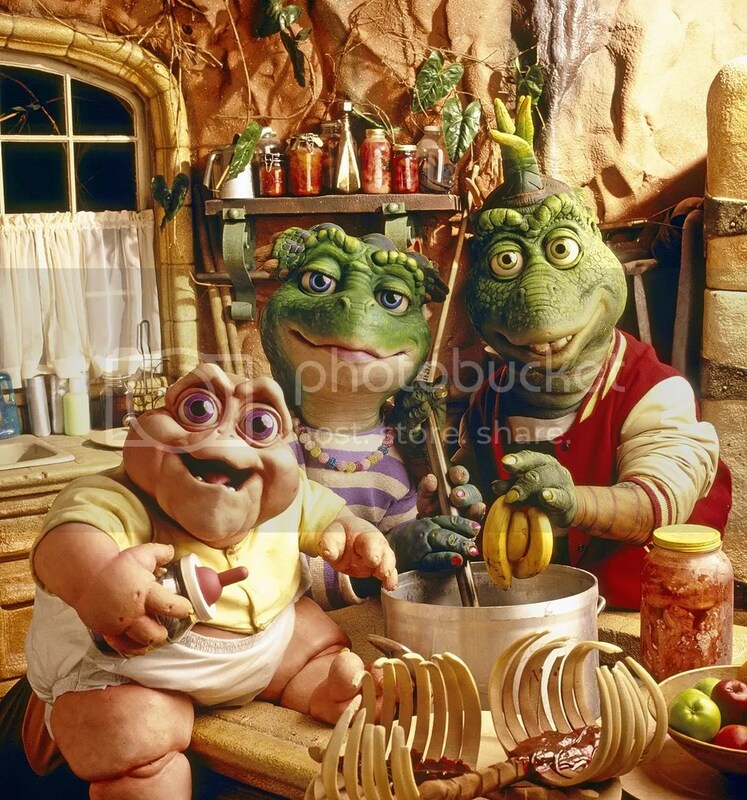 Kids love dinosaurs, right? He would go on to show up in a few real comics as a teen Avenger, bouncing through Avengers: The Initiative and Avengers Academy before being dumped unceremoniously into Avengers Arena. Stegron the Dinosaur Man is one of two — count’em, two! — were-dinosaurs at Marvel Comics, and he’s the less famous. 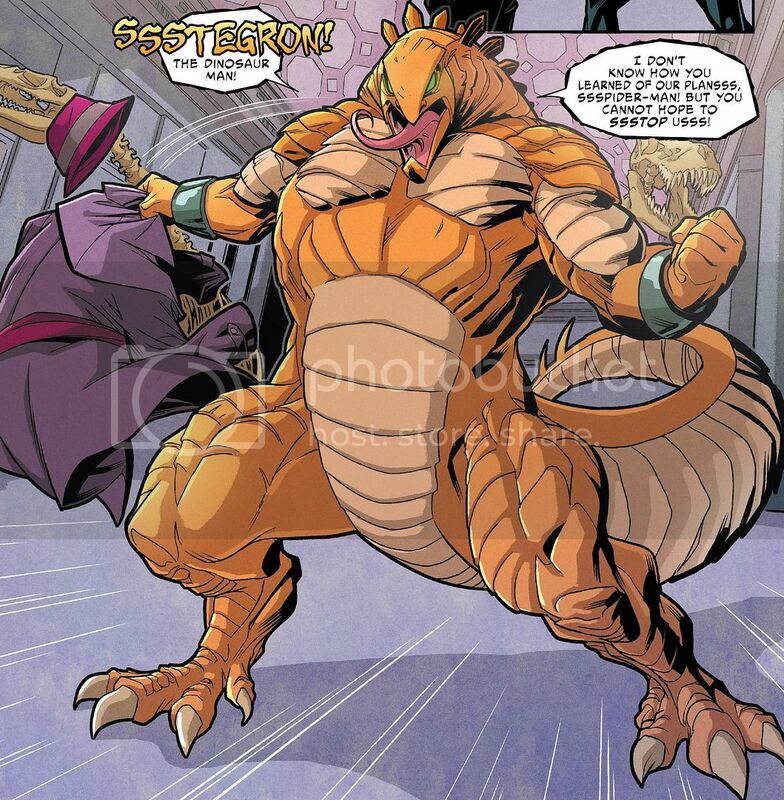 Stegron is a giant orange Stegosaurus man who fights Spider-Man on occasion. His origin is actually pretty cool: Dr. Vincent Stegron was hired by S.H.I.E.L.D. to work with Dr. Curt Connors (the Lizard) to study dinosaurs from the Savage Land. Because if the Savage Land exists, I should hope S.H.I.E.L.D. is studying it. Where’s that episode of Agents of S.H.I.E.L.D.? Anyway, Stegron goes evil and combines some dino DNA with the Lizard formula and BAM, instant Dinosaur man! He also had the power to control other dinosaurs and planned to use them to take over the world! Too bad he got punched out by Spidey! Sauron is just plain weird, you guys. Karl Lykos was bitten by a mutant Pterodactyl in Tierra del Fuego and somehow contracted the ability to drain the life force of others. 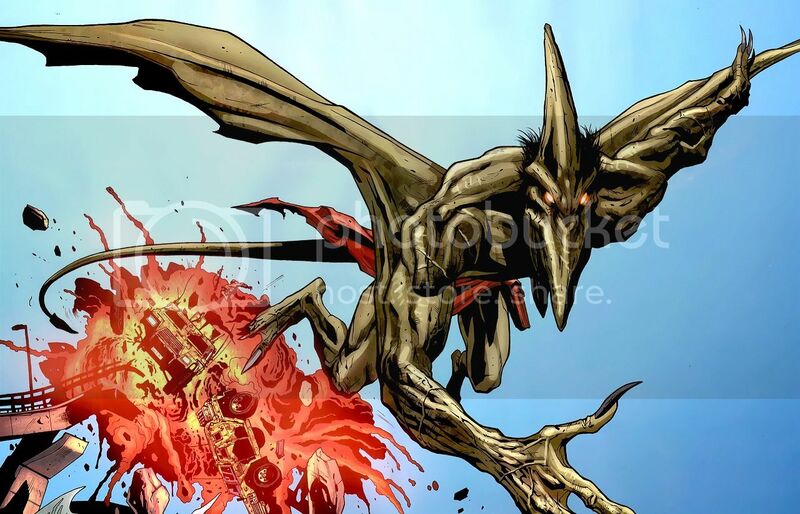 When using his power on mutants, it turns him into a were-Pterodactyl! Being a total geek, Lykos named himself after Sauron from the Lord of the Rings, because awesome. He’d go on to become an enemy of the X-Men, because of the mutant angle, even though he wasn’t a mutant himself. Back when he was first created, Sauron had a pretty compelling love story to go along with his insane villain schemes, but his lady love was eventually killed and he’s been kind of a comic relief for awhile now. But for awhile there, Sauron was a pretty evil guy, likely in spite of his long green head. And yes, Sauron and Stegron have totally teamed up to turn people into dinosaurs. They were defeated by Spider-Man and some X-Men. Posted on November 30, 2016, in Comics, Lists of Six! and tagged dinosaurs. Bookmark the permalink. 1 Comment.